Just like in a regular manicure, cuticles are pushed back and nails are filed. Nails are also buffed, so the gel “polish” is applied to each nail, and cure in the gel light. The gel color will last longer than the regular polish. It is a quick process and does not need to be dry it will be cure in the gel light. We have here, over 800 colors that you can choose from. In a rush? No problem this "quick fix" is for you. First, you'll soak your feet in warm sanitized whirlpool foot bath. Then your nails will then be trimmed, filed, shaped and buffed. Next, your cuticles will be pushed back and trimmed, your toes will be cleansed with soaped brush. A polish is applied for the finishing touch! Our standard service which starts with a warm sanitized water soak in a whirlpool foot bath. Your nails will then be trimmed, filed, shaped, and buffed. Next you cuticles will be pushed back and trimmed. Then, a pumice stone bar will rub on the bottoms of your feet to remove any dry skin or calluses. This followed by a relaxing message using hydrating lotion and oil, a hot towel cleansed the lower legs. Polish is then applied for the finishing touch. Includes the "Basic" pedicure service with the added exfoliating pineapple scrub to remove any flaky, dry skin on your lower legs. Then a clay masque rubbed on to re-hydrate and protect your skin. Followed by a saran wrap topped with hot towel wrapped around your legs, then after a relaxing massage using pineapple oil to soothe your skin. Finishing with another hot towel cleansing throughly your lower legs. Finally a polish is applied to make your toes pretty again. Add Callus Treatment for $3 more. If you would like to relax and massage after a long day, then this is the pedicure for you. This includes the "Basic" pedicure service. First, your lower legs will be rubbed and massaged with Organic scrub to exfoliate and moisturize. Then a cooling Organic mask is put to massage and promote skin rejuvenation. Next a saran wrap and hot towel is wrapped around your lower legs leaving your skin smooth and fresh feeling. Another hot towel is used to clean the remaining mask and finishing with a polish to make your toes perfect again. This service will leave your legs and feet feeling fresh and revitalized and make it a day, this truly is a pampering pedicure. 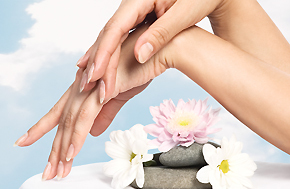 ACRYLIC NAILS ($30 &UP)	(Detail Acrylics nails are artificial nails. Not a replacement, but an extension for natural nails. There are two main approaches to creating artificial nails—tips and forms. Tips are made of lightweight plastic plates that are "nail"-shaped. Forms are fitted over the nail and then an artificial nail is molded out of acrylic and the form is removed and then properly shaped and buffed to a shine. Acrylic nails are a combination of a liquid monomer and a powder polymer. They create a hard protective layer over your natural nails. The product hardens as it is exposed to the air. Acrylic is transparent. A nail polish is added after. Hard gel or Builder gel gets its name because, once cured, it is tough enough to be made into a nail extension. Nail extensions are artificial nails created by using a nail product to extend the nail past the edge of the natural nail. All forms of gel require curing, or hardening, under a UV or LED light.UV and LED curing refers to the chemical process that occurs when photo initiators within the gel itself are exposed to the UV or blue light. The chain reaction creates heat while oligomers combine to form long chains during the polymerization process. These long, bonded chains make the gel hard and cause photoinitiators within the gel product to begin the curing process. Usually, once the nail extension and/or gel manicure has been finished, there is a residual tacky layer, referred to as the "inhibition layer," that is removed by wiping with a preferably lint-free wipe soaked in high concentrate alcohol. The process typically ends with an application of cuticle oil on all fingers, to bring back nourishment into the cuticle after harsh alcohol application. UV GEL OVERLAY ($40 No plastic tip.Has a clear base, will see thru your nails.) (Detail Hard gel or Builder gel gets its name because, once cured, it is tough enough to be made into a nail extension. Nail extensions are artificial nails created by using a nail product to extend the nail past the edge of the natural nail. All forms of gel require curing, or hardening, under a UV or LED light.UV and LED curing refers to the chemical process that occurs when photo initiators within the gel itself are exposed to the UV or blue light. The chain reaction creates heat while oligomers combine to form long chains during the polymerization process. These long, bonded chains make the gel hard and cause photoinitiators within the gel product to begin the curing process. Usually, once the nail extension and/or gel manicure has been finished, there is a residual tacky layer, referred to as the "inhibition layer," that is removed by wiping with a preferably lint-free wipe soaked in high concentrate alcohol.